TODAY is Groundhog Day, and celebrity groundhog Punxatawney Phil's ceremonialized annual weather prediction will once again unfold in Punxatawney, Pa.
How this particular groundhog was selected for the task is a mystery, but as the appointed spokesman (spokeshog?) 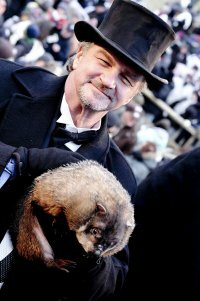 for all of his fellow groundhogs – and perhaps by extension all wildlife – Phil and his clutch of top-hatted human handlers have been saddled with a greater responsibility in recent years. That is because a clear consensus within the scientific community has emerged over evidence that points to the earlier arrival of spring each year. Last year, the Oakland Tribune reported that changes in climate are so noticeable that scientists can track them from space; according to the report, "satellites measuring when land turns green found that spring `green-up' is arriving eight hours earlier every year on average since 1982 north of the Mason-Dixon line." Perhaps a groundhog's opinion is less than scientific, but every Feb. 2, Phil's is the message that gets the most attention. The prediction of an early spring – which scientists have been describing for some time now, but which Phil has made in only two of the last 10 years – once had a joyous ring in frigid Punxatawney. That prediction is now increasingly cause for alarm. If the data posted by Phil's "Inner Circle" at Gobbler's Knob continues to differ from that of the scientific community, that divergence will become more troubling with each passing February. It even has a vague whiff of conspiracy. Phil, why are you hiding the truth? I'd like, just once, for Phil the groundhog to break with convention and cast aside any concerns the bearded men in the black coats who annually hoist him in front of the cameras may have, and tell it like it is: that global climate change is not a matter of political opinion, but one of scientific record.